For the UK-based musician, see Alejandro Toledo (musician). This name uses Spanish naming customs: the first or paternal family name is Toledo and the second or maternal family name is Manrique. 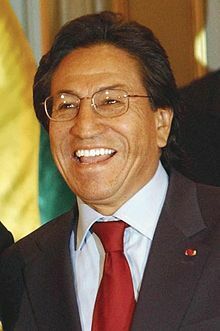 Alejandro Celestino Toledo Manrique (Spanish: [aleˈxandɾo toˈleðo]; born 28 March 1946) is a Peruvian politician who served as the 63rd President of Peru, from 2001 to 2006. He was elected in April 2001, defeating former President Alan García. Toledo came to international prominence after leading the opposition against President Alberto Fujimori, who held the presidency from 1990 to 2000. Toledo was born into an impoverished family of indigenous peasants of Quechua heritage. He was the eighth oldest of sixteen brothers and sisters, seven of whom died in childhood. He was born in the village of Ferrer, Bolognesi, but registered in the nearby town of Cabana, Pallasca Province, Ancash Department. As a child he worked shining shoes and selling newspapers and lottery tickets. When, at age 11, he finished grade school, his father expected him to leave school and get a job to support the family. With his teacher's encouragement, Toledo was able to continue his schooling by working nights and weekends, becoming the first person in his family to attend high school. Toledo eventually found employment as a news correspondent for La Prensa in Chimbote, where he interviewed several high-ranking politicians. Toledo's prospects improved when two Peace Corps volunteers, Joel Meister and Nancy Deeds, arrived in Chimbote looking for lodging and arrived at his family's door. The two Americans were drawn to Toledo by his "industriousness and charm," and his long conversations with them during the year that followed introduced Toledo to a world outside his small fishing village and inspired him to apply for a local civic group's scholarship to study in the United States. He was chosen to receive a one-year grant, and while in the United States, Deeds and Meister helped him get into the University of San Francisco's special program for non-English speakers. Toledo received a BA degree in economics and business administration at University of San Francisco by obtaining a partial soccer scholarship and working part-time pumping gas. Starting in 1970 he attended Stanford University, where he earned two MAs and, in 1993, a PhD in human resources from the graduate school of education. From 1981 to 1983, Toledo directed the Institute for Economic and Labor Studies in Lima, a subdivision of the Ministry of Labor and Social Development. During the same period, he also served as chairman of the Economic Advisory Committee to the president of the Central Reserve Bank and the labor minister. Throughout his academic and governmental career, Toledo worked as a consultant for various international organizations, including the United Nations, the World Bank, the Inter-American Development Bank, the International Labour Organization (ILO), and the Organisation for Economic Co-operation and Development (OECD). He led the 1989 UNDP/ILO mission for the evaluation of: "Impact of Macroeconomic Policies on Growth, Employment and Salaries", in six Central American countries. Toledo has also been a professor at ESAN, one of Peru's leading business schools, serving as its director from 1986 to 1991. From 1991 to 1994, he was an affiliated researcher in the field of international development at the Harvard Institute for International Development. He has also been a guest professor at the University of Waseda in Tokyo and at the Japan Foundation. Toledo entered politics as an independent candidate for the presidency (winning 3% of the vote) in the 1995 election in which Alberto Fujimori was ultimately re-elected. Despite his loss, the party he founded in 1994, Perú Posible, gained popularity and influence over the next few years. Toledo declared his intent to run again in the 2000 election and despite a constitutional controversy about his eligibility to serve a third term, Fujimori also announced his candidacy. Despite being a relatively low-profile politician, Toledo suddenly found himself the leader of the opposition to Fujimori's presidency. Toledo promised to uphold and strengthen the market program that had been put in place, while also mitigating inequality issues attributed to it. He promised to pursue democratic reforms and reinvigorate Peru's social infrastructure. During the campaign, he promised to raise the wages of civil servants, which had been stagnant under Fujimori, and to create 400,000 jobs a year through programs designed to encourage agriculture, tourism, and small business. Toledo repeatedly called for the expansion of investigations into government, including investigations into allegations that the Fujimori administration had stolen billions from government coffers. Racial-ethnic themes also echoed throughout the campaign. Toledo was running to become Peru's first indigenous president. He referred to himself as El Cholo throughout his campaign, and many indigenous Peruvians hoped that as president he would bring greater attention to issues of importance to them. Toledo's background, engaging manner, and informal attitude made him an attractive candidate to both indigenous and non-indigenous Peruvians. Just minutes after the polls closed at 4:00 pm on April 9, 2000, major news networks rushed to announce that Toledo had garnered more votes than Fujimori. These announcements were based on projections from Peru's top polling firms, which base their numbers on exit polls. The prominent pollsters quickly modified projections based on samples of actual vote counts from selected polling places, better known as the "quick count". Shortly after receiving news of Toledo's encouraging performance in the initial stage of the vote count, supporters gathered in the streets around Toledo's hotel room. An enthusiastic Toledo walked out onto the balcony of his room wearing a red headband, reminiscent of ancient Inca warriors. He optimistically speculated that a first round victory might be within his grasp but still urged his supporters to wait for the results of the quick count. The second wave of quick count results reversed earlier projections, projecting a round one Fujimori plurality and possible majority. Fujimori had a projected lead of 48.73% to 41.03% later that evening. Fujimori was closing in on the 50% mark which would give him a victory in the first round, with no runoff necessary. Allegations of fraud were made, and were not far-fetched. On the day preceding the election, Transparencia, the national election observation organization, reported that it had received information concerning a website with capabilities to hack into the ONPE (Oficina Nacional de Procesos Electorales) computer system. Eduardo Stein also claimed that ONPE had made no provisions for OAS technicians to monitor the vote count system in real time. Toledo claimed that a fraud had been perpetrated; other opposition candidates agreed and joined protests led by Toledo. Though "the U.S. State Department had supported Fujimori and his economic policies, it described the results of the 2000 elections as "invalid". Since no candidate had received a majority of the vote, a runoff was required, but Toledo refused to participate in a second round against Fujimori. He unsuccessfully petitioned to have the election annulled, and lobbied international organizations and foreign government to deny recognition to Fujimori's government. On July 28, 2000, Peruvian Independence Day, Fujimori began his third term as president. Toledo led a group of protesters towards Congress. The massive demonstration was peaceful at first, but violence broke out and a powerful explosion led to the death of six people. It was later discovered by the Peruvian judiciary that the explosion had been planned and carried out by the National Intelligence Service, run by Vladimiro Montesinos, who had already been indicted on corruption and bribery charges. Montesinos fled to Venezuela, where he hid for several months before being captured and brought back to Peru. The charges against Montesinos ranged from bribery to drug trafficking to arranging death squads. But it was the release of the "Vladi-videos" that prompted retreat by Fujimori. The first of these incriminating videos showed Montesinos bribing a congressman with US$15,000 to switch to Fujimori's camp. In November 2000, amid growing allegations of fraud and corruption within his administration, Fujimori agreed to hold new elections in 2001, and not to stand as a candidate. While he was attending the APEC forum in Brunei, Fujimori's party lost control of the Congress. Fujimori then flew to Japan, where he submitted his resignation and claimed Japanese citizenship. After the fall of Fujimori, the newly elected president of the Peruvian Congress, Valentín Paniagua, became interim president and oversaw the already planned new elections on May 29, 2001. Toledo won after a close run-off election against former President Alan García of the APRA party, with 52.23% of the vote, to Garcia's 47.77%. Toledo thereby became the first South American president of indigenous descent to be democratically elected in five hundred years. During his campaign, Toledo promised Peruvians higher wages, a fight against poverty, anti-corruption measures, higher pensions, more employment, military reform, development of tourism, and industrialization. As Pedro Pablo Kuczynski noted “Toledo comes after almost 30 years of either dictatorships or governments that weren't so democratic. People expect Toledo to solve all the problems of the last 30 years, which included an enormous increase in relative poverty." Toledo's inability to fulfill many of these promises created widespread dissatisfaction. His approval ratings were consistently low throughout his presidency, sometimes sinking into single digits. Touting his heritage throughout his campaign, Toledo continued the efforts begun by Paniagua, who had brought together experts and indigenous leaders to discuss the needs of indigenous people throughout the country. Toledo's inauguration ceremony on Machu Picchu was attended by all the presidents of the neighboring Andean states who joined him in signing the “Declaration of Machu Picchu,” promising to protect indigenous rights. Maria Elena García calls the years of Toledo's presidency a transition ripe with new opportunities for indigenous people, noting the “reframed state-indigenous interactions”, “increase in NGO projects and social movements”, and “proliferation of indigenous organizations.” Toledo created and first lady Eliane Karp headed a new agency for indigenous and Afro-Peruvian affairs, CONOPA (Commission for Amazonian, Andean, and Afro-Peruvian Peoples). The agency was meant to establish a development agenda for indigenous communities, provide representation of indigenous interests within the government, and lead the way for multicultural constitutional reforms. Some critics viewed these actions as a state co-optation of indigenous identity, mockingly dubbing the agency the "Karp Commission". However, Oxfam's Martin Scurrah points out the agency's good work, noting that in addition to promoting a chapter on indigenous rights in the new constitution, Eliane Karp has "intervened on numerous occasions in support of or in defense of indigenous initiatives." As president, Toledo made it a priority to try to recover ancient Incan artifacts from Yale University's Peabody Museum of Natural History. Some art historians claimed that such artifacts, found at Machu Picchu, could help the Peruvian people to gain knowledge of their ancestry. He also brought serious attention to bilingual education in indigenous schools, creating a new and well-staffed division within the Ministry of Education devoted to the issue. This effort gives advocates greater autonomy and opportunity to influence policy and work toward institutionalizing bilingual education. Throughout his administration, enrollment rates in primary and secondary education remained high and private-school enrollment increased, but overall literacy and test scores improved only slightly. In an interview on his last day in office, Toledo expressed frustration that his administration had not done more to improve education. During his first year in office, Toledo replaced previous health-insurance programs aimed at the poor with a more comprehensive free insurance program, Seguro Integral de Salud (SIS). The program aimed to provide Peruvians without health insurance with improved access to health care. By the end of his term, SIS covered more than 11 million Peruvians living on the outskirts of cities or in rural areas. However, about a third of the country remained without health coverage. The program has been immensely popular. President García expanded the program, which has been praised by neoliberal reformers for extending coverage to indigenous people and women. They also note that it has addressed with considerable success the fact that Peruvian women's healthcare costs are much higher than men's owing to higher rates of illness and reproductive issues. The legislature continues to build upon SIS, using it as a basis for what many hope will someday be universal healthcare coverage for all Peruvians. Peru faced a major housing deficit in 2001, with the majority of its urban population living in slums. Toledo's administration sought to improve access to affordable housing through subsidies, loans, down payments, land titling, and encouraging financial institutions to reach further down-market. Most of these efforts were grouped under the Fondo Mivivienda, which was a program started in 1999. The Truth and Reconciliation Commission, which had been implemented by interim president Paniagua, was tasked with examining largescale acts of violence and atrocities committed within Peru between 1980 and 2000, to assess responsibility and pave the way for reparations. The Commission's final report to President Toledo was issued in 2003, and concluded that approximately 69,000 people had been killed by the Shining Path and other extremist groups, the bulk of the victims being innocent peasants. In January of that year, the Constitutional Court repealed several anti-terrorism measures enacted during Fujimori's administration. It was estimated that 54% of these victims were killed by the extremist guerrilla group Shining Path, 30% by the Peruvian Military and police forces, and the rest were by rural or peasant self-defense militias. These investigations were financed by a portion of the US$360 million discovered in foreign accounts which had been stolen by Fujimori officials. Toledo wasted no time in pursuing suspected terrorists, arresting 199 of them in 2002 alone. In late 2001, the Directorate against Terrorism reported that the Shining Path, a terrorist movement which has been active since the eighties, was organizing along new fronts and infiltrating protests, blocking highways, and organizing student marches. The government reacted by reestablishing five counterinsurgency bases, which soon assisted in destroying six Shining Path camps. But terrorist activity continued and in 2003, Toledo declared the first of several states of emergency due to the terrorist threat. Toledo walked a thin line in responding to both U.S. pressure to severely limit coca-production and protests by coca farmers against the eradication of coca production in poor, rural areas, where the majority of the population is involved in that business. The presumed link between the Shining Path and narcotics trafficking was unclear, because the coca farmers gave most of their crops to drug traffickers who then paid the Shining Path to operate within certain regions. Recognizing the drug trade as a threat to regional security, Toledo sought to create a common Andean approach to the drug war. He saw that revenue from drug trafficking funded terrorist activities, but also that U.S. insistence on the eradication of coca crops failed to address the problem. Alternative crop programs were also being resisted by coca farmers who depended on the coca trade for their livelihood. At a meeting of the 19-member Rio group in May 2003, Toledo proposed developing a joint strategy to deal with drug trafficking, but pressure from Washington, which preferred bilateral efforts, helped kill the notion. The Toledo administration was unusually active in foreign policy. Its major goals were promoting democracy outside Peru, addressing the struggle against poverty, encouraging economic development in the borderlands, reducing arms spending in the region, strengthening relations with Asia-Pacific countries, and integrating with the Andean Community of Nations. Peru also became an associate member of MERCOSUR, a free trade zone that would be established gradually. The objective was for signing nations to gradually build up an infrastructure that would ease trade with one another, to cooperate in the improvement of energy efficiency, and to commit to future agreements that would increase cross border investment by eliminating double taxation. Toledo attended Evo Morales’ inauguration in 2006, indicating a willingness to work with his administration, but Morales joined his mentor, Hugo Chavez, in repeatedly making offensive comments about Toledo and his government, especially after the successful conclusion of Peru's free trade agreement with the U.S., which soured official relations with Colombia. In conducting Peru's relations with Brazil, Toledo's goal was to reorient Peru from the Andean Community, toward the more economically active Brazil and MERCOSUR. In August 2003, Toledo met with Brazilian ex-president Lula. They committed to increased political and economic cooperation under the Initiative for Integration of Regional Infrastructure in South America which invests in large-scale, debt-heavy projects, aimed at developing 10 economic axes or hubs throughout South America. Construction projects, including roads, discussed. President Lula also agreed to allow Peru access to two surveillance systems which Brazil had developed in the Amazon Basin to target legal and illegal activity. Concern for security and trafficking led the Toledo administration to prioritize the reinforcement of its border with Colombia and the improvement of police coordination. In 2003, with increased private and UN investment in the area, the two countries agreed to establish an integrated frontier zone which treats air travel between border cities as domestic travel and simplifies customs and tariff procedures. Most of the Toledo administration dealings with Chile involved concern over the latter procurement of arms. Despite Toledo's repeated call for regional arms reductions, Chile continued purchasing arms, including 10 F-16 fighters from the U.S. and one hundred Leopard 2 tanks from Germany. Relations with Venezuela deteriorated during the latter half of the Toledo presidency owing to opposing philosophies and policies of Presidents Toledo and Chavez. The issues contributing to the tension between the two countries included Venezuela's shielding of Vladimiro Montesinos, and Venezuelan interference in Peruvian politics. (157) This included Chavez's official endorsement, and unofficial financial backing of leftist candidate Ollanta Humala in Peru's 2006 presidential race, which was soon seconded by President Morales. The U.S.-Peru agreement has faced criticism. In Peru, the treaty was championed by Toledo, and supported to different extents by former President Alan García and candidates Lourdes Flores and Valentín Paniagua. Current President Ollanta Humala has been its most vocal critic. Humala's Union for Peru won 45 of 120 seats in Congress in 2006, the largest share by a single party, prompting debate on ratification of the agreement before the new legislature was sworn in. Some Congressmen-elect interrupted the debate after forcibly entering Congress in an attempt to stop the agreement ratification. Toledo was unable to run for reelection in 2006; after he took office, the constitution was amended to restore the pre-1995 ban on immediate reelection. After his presidency, Toledo went to the United States, where he served as a Distinguished Scholar in Residence at the Center for Advanced Study in the Behavioral Sciences at Stanford University, during the 2006–2008 academic years. Toledo was named a Distinguished Visiting Fellow at the Hoover Institution at Stanford University from 2006 to 2009, and in 2007–2008 was a Payne Distinguished Visiting Lecturer at Stanford University's Freeman Spogli Institute for International Studies and a CDDRL (Center on Democracy, Development and the Rule of Law) Visiting Scholar. While at Stanford, Toledo founded and continues to serve as the President of the Global Center for Development and Democracy, based in Latin America, the United States, and the European Union which 'aims to help Peru and Latin American countries build institutional bases for greater stability, with a wide political commitment to democracy, that is decentralized and equal to all". In 2007, following the closing of media outlet RCTV in Venezuela, Toledo published an op-ed in the New York Times condemning the action of President Hugo Chavez's government as a violation of free speech. Toledo called for intervention by the Organization of American States, citing its commitment to protecting the development of democratic institutions, including the press. He also called for "continent-wide solidarity" on the grounds that the repression of free speech in a country is felt beyond the country itself. He warned that if Venezuela were allowed to silence its press without repercussions, this would encourage similar repression in the rest of Latin America, because "[w]hen one voice is silenced, we all become mute. When one thought is eliminated, we all lose some awareness. And when a space for the expression of ideas becomes closed, we all become trapped in the dungeons of dictatorship." In 2009, Toledo joined the Brookings Institution as a nonresident senior fellow. His works on the Latin America Initiative, a joint effort of the Global Economy and Development and Foreign Policy programs at Brookings. The initiative focuses on the most critical economic, political and social issues facing the region. Research activities are concerned with a wide range of topics, including the challenges that a changing world economy poses for Latin America, the impact of organized crime on democratic institutions and economic prosperity, trade and investment policies, strategies to tackle poverty and inequality, combating climate change, and Cuba's political transition. Toledo is also a member of the United Nations Steering Committee on the Human Development Report for Latin America, a member of the Club of Madrid, and a member of the International Board of Governors of the Peres Center for Peace in Israel. Toledo attended the San Francisco Freedom Forum in 2011 to discuss democracy in Latin America. Toledo created the Global Center for Development and Democracy. The center works with low income individuals in developing countries with the goal of helping them become self-sufficient entrepreneurs, along with governments and other organizations to help combat institutionalized poverty. In 2010, Toledo joined the Spanish Prime Minister José María Aznar, Nobel Peace Prize Laureate David Trimble, Italian philosopher Marcello Pera, former United States Ambassador to the United Nations John Bolton, British historian Andrew Roberts, and others in forming the Friends of Israel Initiative. The project's aim is to counter efforts to delegitimize the State of Israel and its right to live in peace within safe and defensible borders. The initiative consists of non-Jewish members who want Israel to continue to be accepted as part of the western world and who recognize it as a full-fledged democracy with the right to defend itself. In a 2011 article entitled "How Not to have a Palestinian State," Toledo and his co-writers argued that Obama's call for a return to talks based on the pre-1967 boundaries is a "clumsily concealed delegitimization device," as Palestine does not meet the internal and external requirements to become a state. The only way forward, the argued, is not unilateral action by the UN General assembly but a bilateral agreement between the Palestinians and the Israelis, in which each party agrees to recognize the other as a legitimate state. In April 2016, Toledo was summoned to court on charges of money laundering over the purchase of several properties via Ecoteva Consulting, a real estate company owned by Israeli businessman Yossi Maiman. Toledo is accused of taking bribes from the Brazilian companies Camargo Corrêa and Odebrecht for the construction of the Interoceanic Highway, and using the money to pay off personal mortgages and buy luxury real estate in the name of his mother in law. In 2015, the Swiss Financial Market Supervisory Authority said the money went from Confiado International Corp, a Panama-based company, to Costa Rica. Meanwhile, Maiman denied the allegations, comparing them to a "smear campaign". In February 20, 2017 a judge ordered 18 months of preventive prison and an international order of capture. The general election, which took place on April 10, 2011, Toledo won 15.62% of the vote putting him behind leftist former army officer Ollanta Humala (with 31.75%), Keiko Fujimori, daughter of the former president (with 23.5%), and Pedro Pablo Kuczynski (with 18.52%), and ahead of Luis Castaneda (with 9.84%). After the initial round, Fujimori received the support of candidate and former president Alan García, while Toledo supported Humala, calling him the lesser of two evils. However, Toledo's support came with conditions, and he threatened to mobilize protests if Humala's presidency did not live up to Toledo's standards in terms of protecting democratic institutions, human rights, and stimulating the economy. Just before the election, an email was released revealing that the socialist president of Venezuela, Hugo Chavez, had given financial support to Humala's 2006 campaign. It also emerged that Humala's wife, Nadine Heredia, had been well-paid for consulting work at a pro-Chavez newspaper. In the final tally, Humala won 51.6% of the vote to Fujimori's 48.4%. The day after the final vote, the Peruvian stock market plunged out of concern for the state of Peru's neo-liberal economic policies. Amidst worries that Humala's election represented a shift too far to the left, Peru Posible, under the leadership of Toledo, announced the month after the election that its members would not accept ministerial positions within the administration and would limit its support of Humala's government to backing on some issues in the Congress. From the beginning of Toledo's presidency, the press took an aggressive stance, scrutinizing the personal and public lives of Toledo and his advisors. Many news outlets were determined to expose corruption in a way that had not been possible under the Fujimori administration. Others wished to prove their independence from the government, which had controlled the press under Fujimori. Ironically, it was Toledo's commitment to maintaining a free press that allowed these attacks to occur. Charges of corruption, nepotism, and graft aimed at Toledo, his family, members of his administration and fellow PP members plagued his presidency. These stories led to many resignations and were the most significant reason forToledo's low approval ratings. Those ratings bottomed out in 2004, following the resignation of his Minister of Agriculture. As of February 2017[update], Toledo is a visiting scholar at Stanford University in the US. In 2016, Odebrecht stated as part of a plea agreement that the company had paid approximately $800 million in bribes in several Latin American countries, including $29 million in Peru from 2001 to 2006, the presidencies of Toledo and his two successors, all of whom have denied the charge of receiving bribes. On 9 February 2017, a Peruvian judge ordered Toledo's arrest over allegations that he took $20m (£16m) in bribes from Odebrecht in return for awarding public works contracts, a reward was offered for his capture, and Interpol was alerted. In 2006, UCSD's Institute of the Americas honored President Toledo with its Award for Democracy and Peace for his efforts in promoting economic growth and strengthening democracy. "It is the force of his personality that has led this country to understand that in this globalized world, there is no alternative to regional integration, to free trade, to sane economic policies," said Jeffrey Davidow, the institute's president. Toledo has received honorary doctorates from University of Winnipeg, Los Andes Peruvian University, and 50 other universities around the world—for a total of 52. He has lectured in more than thirty countries on issues of poverty, economic growth, and democracy, as well as on the benefits of human-capital investment. July 28, 2011 was the tenth anniversary of Toledo's inauguration, an event catalogued in the Associated Press's "Highlights in History" for that day. In October 2011, Tbilisi State University awarded an honorary doctorate to Toledo "for his special role in establishing and developing relations between Peru and Georgia." Despite the largely negative press coverage of his presidency, many of Toledo's harshest critics recognize the high premium that Toledo put on democratic processes and safeguards. In recognition of his efforts to preserve the freedom of the press Enrique Zileri, President of the Peruvian Press Council, affirmed in May 2003 that there were no problems with press freedom in Peru. Toledo received the Grand Cross of the Order of Saint-Charles from Monaco in 2003. Among Toledo's publications are works on economic growth and structural reforms. His latest book, Las Cartas sobre la Mesa (The Cards on the Table), recounts his political career and the founding of Perú Posible. Cartas Sobre la Mesa, Instituto de Investigacion para el Desarrollo, segunda edicion, 2003, Lima, Peru. “The Challenge of Growth and Social Investment in the 90’s” (Chap. 1), Co- author in Alessandro Pio, Economic Adjustment and Social Development: Complementary or Conflict, Milan, Italy, ISLA, Insituto di Economia “Ettore Bocconi”, Universidad L. Bocconi, E.G.E.A., SPA, 1992. The Other Faces of Informal Society (Ed. with Alain Chanlat), Lima, IDE/ESAN and HEC (Ecole de Hautes Etudes Commerciales), University of Montreal, Canada. September 1991. Peru and Latin America in Crisis: How to Finance Growth (editor), Instituto de Desarrollo Economico, ESAN, Lima, Peru. (Second Edition, 1990). Economic Stabilization and social adjustment: evaluation of the first 90 days Peru Economic Program of 1990); technical forum (editor) Lima, ESAN/IDE, December 1990. “Can Education Policy Equalize Income Distribution in Latin America? The cases of Brazil, Mexico and Peru” (with M. Carnoy, I. Velloso, and J. Lobo). Saxon House, England, 1979. ^ José Barreiro, Tim Johnson (2005). America Is Indian Country. Fulcrum Publishing. p. 184. ISBN 978-1-55591-537-7. ^ a b "Stanford Magazine - Article". alumni.stanford.edu. Retrieved 16 October 2014. ^ East, R.; Thomas, R. (2003). Profiles of People in Power: The World's Government Leaders. Taylor & Francis Group. p. 412. ISBN 9781857431261. Retrieved 16 October 2014. ^ Krauss, Clifford (June 5, 2001). "Man in the News: Alejandro Toledo". The New York Times. ^ a b Bridges, Tyler (February 11, 2007). "From president of Peru to just Palo Alto Guy". San Francisco Chronicle. ^ a b "FSI - Alejandro Toledo". fsi.stanford.edu. Archived from the original on 4 April 2014. Retrieved 16 October 2014. ^ a b c "Alejandro Toledo, PhD". Freeman Spogli Institute for International Studies. Stanford University. Archived from the original on 4 April 2014. Retrieved 23 July 2011. ^ Sebastian Rotella. "Peru's Victor Happy, But Anxious." Los Angeles Times. 5 June 2001. Retrieved 29 June 2011. ^ Benjamin Keen and Keith Haynes (2008). A History of Latin America. ISBN 9780618783182. Retrieved 27, 2011. ^ Sebastian Rotella and Natalia Tarnawiecki. "Fujimori Takes Oath Amid Violence, Protests in Peru." The Los Angeles Times. 29 July 2000. Retrieved 27 June 2011. ^ "Election Guide: Peru" Consortium for Elections and Political Process Strengthening, Retrieved May 2011. ^ Keen, B.; Haynes, K.A. (2009). A History of Latin America. Houghton Mifflin Harcourt. p. 535. ISBN 9780618783182. Retrieved 16 October 2014. ^ Moore, Sarah. "Former Peruvian President links ethnicity to poverty". article. Standord University. Archived from the original on 2014-03-11. Retrieved 24 December 2012. ^ "Máxima corte peruana anuló leyes antiterroristas de Fujimori - ENE. 04, 2003 - Internacionales - Historicos - EL UNIVERSO". eluniverso.com. Retrieved 16 October 2014. ^ Mann, S. (2006). Peru's Relations with Pacific Asia: Democracy and Foreign Policy Under Alan Garcia, Alberto Fujimori, and Alejandro Toledo. Lit. ISBN 9783825888206. Retrieved 16 October 2014. ^ "Peru Trade Promotion Agreement | Office of the United States Trade Representative". ustr.gov. Retrieved 16 October 2014. ^ a b "Payne Distinguished Visiting Lecturer" Archived 2014-04-04 at the Wayback Machine, CDDRL Visiting Scholar 2007–2009. Retrieved November 2010. ^ "Global Center for Development and Democracy". Archived from the original on 2011-06-25. Retrieved 16 October 2014. ^ Alejandro Toledo, "Silence = Despotism," The New York Times, June 6, 2007, accessed May 20, 2011, https://www.nytimes.com/2007/06/06/opinion/06toledo.html. ^ "Daw Aung San Suu Kyi in San Francisco to receive Václav Havel Prize; Top Innovators and Dissidents Unite at San Francisco Freedom Forum". Human Rights Watch. Archived from the original on 31 August 2012. Retrieved 28 December 2012. ^ Valencia, Robert (2012-11-30). "State of Democracy: A Conversation with former Peruvian President Alejandro Toledo". World Policy Blog. Retrieved 6 December 2012. ^ "Who we are". Global Center for Development and Democracy. Archived from the original on 20 October 2014. Retrieved 21 December 2012. ^ "Friends of Israel". friendsofisraelinitiative.org. Archived from the original on 10 October 2014. Retrieved 16 October 2014. ^ a b Post, Colin (April 22, 2016). "Peru: former President Toledo to face trial for money laundering". Peru Reports. Retrieved October 21, 2016. ^ Romero, César (March 28, 2015). "Denuncian a Toledo, su esposa, su amigo Maiman y su ex seguridad Dan On". La República. Retrieved October 21, 2016. Eva Fernenbug y Josef Maiman y la Cooperación Internacional Suiza han indicado que ese dinero provenía de cuentas en ese país de la empresa Confiado International Corp, que pasaron por Panamá, hasta llegar a Costa Rica. ^ "Josef Maiman sobre Ecoteva: "Es una manera de atacar a Alejandro Toledo"". La República. August 9, 2015. Retrieved October 21, 2016. "Ecoteva no le compra casas a Alejandro, sino para ser dueño de la propiedad, para alquilarla, quizás venderla con alguna plusvalía. Entre Toledo y yo no pasó nada, cuando hago una inversion lo hago bajo una razón social, no lo hago con mi nombre. Me acusan de lavado, pero lo último que he lavado ha sido mi ropa de baño", explicó, en entrevista al programa 'Sin peros en la lengua'. ^ "Former Peruvian President Alejandro Toledo gears up for Peru’s 2011 presidential elections" 8 September 2008. Peruvian Times. Retrieved 29 June 2011. ^ "Peru 2011". World Elections. 13 April 2011. Retrieved 22 July 2011. ^ "Ollanta Humala Wins Peru Election Over Keiko Fujimori." Archived 2011-06-09 at the Wayback Machine Fox News Latino. 06 June 2011. ^ a b Oppenheimer, Andres. 06 June 2011. "Humala won't be a Chavez--for now." The Miami Herald. ^ Kozak, Robert (12 May 2011). "Venezuela Contributed To Peru Humala's 2006 Campaign – Report". InterAmerican Security Watch. Archived from the original on 28 March 2012. Retrieved 23 July 2011. ^ "Peru election winner Humala congratulated by rival". BBC News. 7 June 2011. Archived from the original on 17 June 2011. Retrieved 23 June 2011. ^ "Humala invites Morales to consider the re-unification of Peru and Bolivia." Mercosur. 22 June 2011. ^ McClintock, Cynthia (23 June 2011). "Peru's Swing Left?". Foreign Affairs. Retrieved 23 July 2011. ^ Fraries, Bill (16 July 2011). "Peru Party Ends Talks Over Humala Government Role, Peru.21 Says". Bloomberg. Retrieved 23 July 2011. ^ Franklin Briceno; Joshua Goodman (February 10, 2017). "Manhunt for Peru's Fallen Ex-President Starts in California". ABC news. Associated Press. ^ Staff, "Campus Honors Peruvian President," The UCSD Guardian, April 20, 2006, accessed May 20, 2011, "Archived copy". Archived from the original on 2011-09-28. Retrieved 2011-05-20. CS1 maint: Archived copy as title (link). ^ Sandra Dibble, "Peruvian president honored by UCSD institute," The San Diego Union-Tribune, April 14, 2006. ^ "Honorary Doctorate Alejandro Toledo" Archived 2017-02-15 at the Wayback Machine. ^ "Honoris Causa degree - Alejandro Toledo". Archived from the original on 2011-09-27. Retrieved 2011-08-19. ^ "In 1943, FDR announces the end of coffee rationing". The Bulletin. 28 July 2011. Retrieved 30 July 2011. ^ "Former President of Peru Visiting TSU". Georgian News Agency. 3 October 2011. Retrieved 6 December 2011. Ronald Bruce St. John, Toledo's Peru: Vision and Reality. Gainesville, FL: University Press of Florida, 2010. Alejandro Toledo (March 2015). The Shared Society: A Vision for the Global Future of Latin America. Stanford University Press. ISBN 978-0-8047-9565-4. Alejandro Toledo, "Latin America in the World Economy," Stanford Graduate School of Business, Dec. 3, 2012. —Video.